I am beyond excited right now ... 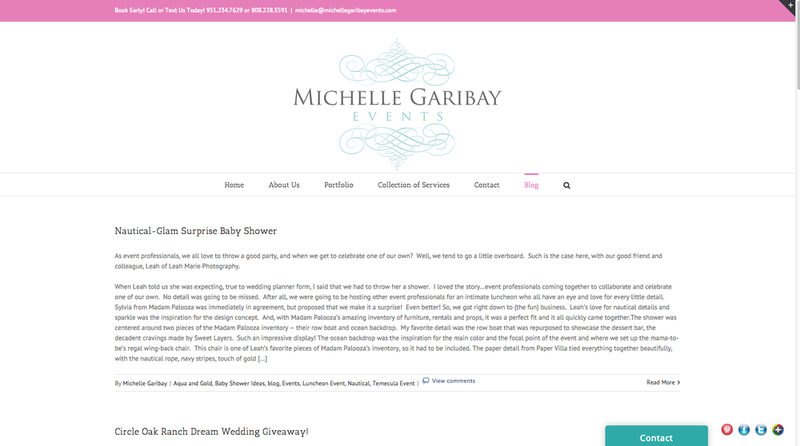 I just completed a project for Michelle Garibay Events and I want to share it with you!! On Friday morning (yes, 2 days ago) Michelle and I were emailing back and forth and I asked her if she was happy with her current website and blog ... she said there were some things that weren't working as well as she wanted ... long story short: we decided to start from scratch and redesign an entirely NEW website for her ... and I was the lucky girl she decided to hire to do it! That new website launched just a few minutes ago ... less than 48 hours after we decided to do it << yeah, I'm just that crazy >> it's all I've been doing since I started ... no time to eat!! I needed to get the old GONE and the new UP!! Because what do I always say??? Your website is YOU in an online form ... it's gotta be awesome!! After I got the 'GO FOR IT' from Michelle to begin the process of this redesign, I used my Editor's Touch and quickly clicked through and browsed each page of her website ... since I've been doing this for years, it was very easy for me to get an idea of what needed to stay and what needed to get the f*ck out of there ... I made some mental notes of what I wanted to do and what I wanted it to look and act like and I dug in. 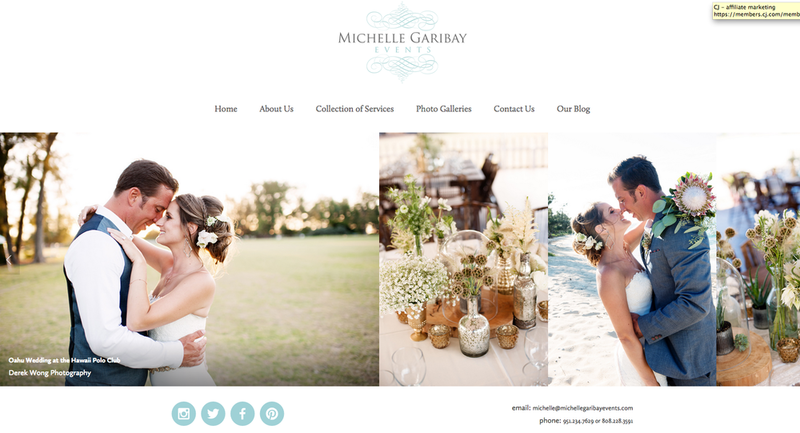 I knew right away that what Michelle needed no matter what was a photo gallery that made sense and showed off her work ... so I decided to create separate galleries according to the category, such as: Palm Springs Weddings, Tablescape Designs, Temecula Weddings ... I added a drop down in the navigation so that if a bride was planning an Oahu wedding, she would be able to choose just those images. The galleries are search engine optimized per image and per gallery ... and when Pinterest pulls an image: BAM!! The search text goes right along with it :) Very important stuff. There are a few pages I'm not fully satisfied with and am still working on and I have lots of inner SEO links to add ... and of course, lots of gorgeous images to fill the galleries with ... but there was enough done where Michelle and I wanted to make it live!!! I will continue for the next week to make tweaks here and there and really make this site sing ... I am a perfectionist, so if I'm not loving something, I will change it until it's exactly how I want it to be. One of the reasons I'm great at designing a website for wedding pros is because all I have done for the last 8 years is stare at wedding vendor websites ... clicking in, clicking around, liking, disliking, clicking out ... my brain KNOWS what a great wedding vendor website looks like and what it should do ... and while I am not a coding whiz, I do know about design and what will make someone stick around ;) If you have been wanting a new website to show off your work or if you just want someone to consult you on what's working and what might not be: contact me and I can help! Buy an 8 Year Old URL and a Facebook Page that has 38,000 Likes | Style Unveiled is Being Auctioned Off | Come and Get it!